I know you aren’t supposed to judge a book by its cover but I did exactly that with this book. The cover is powerful! 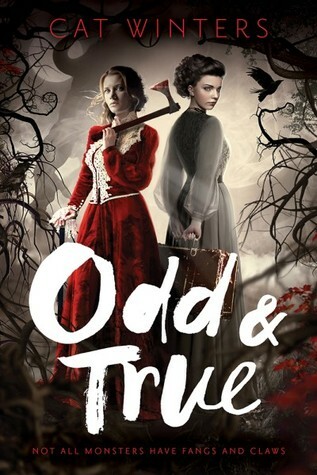 The voices of Trudchen and her sister Odette tell this story, each from their own points of view and in progression as they go from children hiding under the covers from monsters int the night, to young ladies actively searching the monsters. From birth they’ve been told they were Protectors, finding and killing monsters. Little by little they come to see how much of what they believed wasn’t true at all. But when the time comes to face a real monster they find they just may have a bit of magic after all. This is a YA book and I have never read Cat Winters before although I have heard of her books. I enjoyed reading about these exceptional girls coming of age and finding themselves. Well Done Ms. Winters! Netgalley/Amulet Books Release Date is September 12th! I’m not much into fantasy but it sounds like a great story. I agree, the cover is fantastic – it makes one want to pick up the book and have a peek! A monster slaying mother, I like that. Very good for young girls.